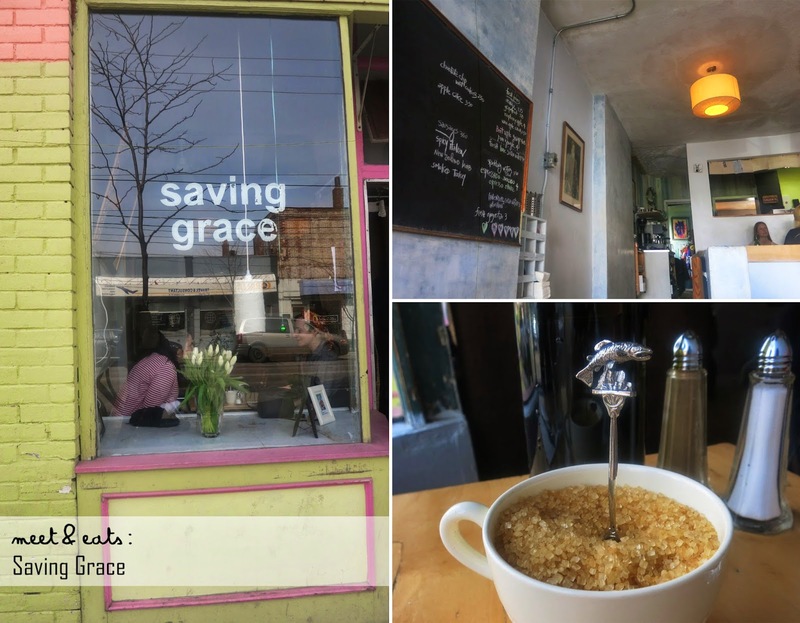 Constant rants of the ridiculous line-ups at Saving Grace, I'm glad that I didn't have to wait for more than ten minutes for a seat on either two visits. Having my sister visit from the land downunder for a month, we were to arrange a heck of a lot of snacks, brunches, lunches and dinners. Her ponder of what a "Hipster restaurant" is really all about, I reluctantly put Saving Grace for brunch onto the list. I was seated by an, again - different, but, fairly cold and rushed server. Saving Grace has specials which they change up daily on a mounted blackboard - the specials range from brunch plates of Waffles with Roasted Plums, to, Quesadillas with Black Beans and Chutney. Other variables are sweets to end a meal, Sausages ($3.50) to add on and fresh Juices ($3~4.25). The Chai Latte was very good, it had a nice depth from the Ginger and Cardamon - the way all Chai Latte should be beautifully made! Watching it all fuse together for the next three minutes after it was placed on our table, was entertaining. The Espressado was the only reason why I was excited for my next visit to this place - it had a perfect balance of sugar, and was a grainy - almost shredded coconut texture of some kind throughout. 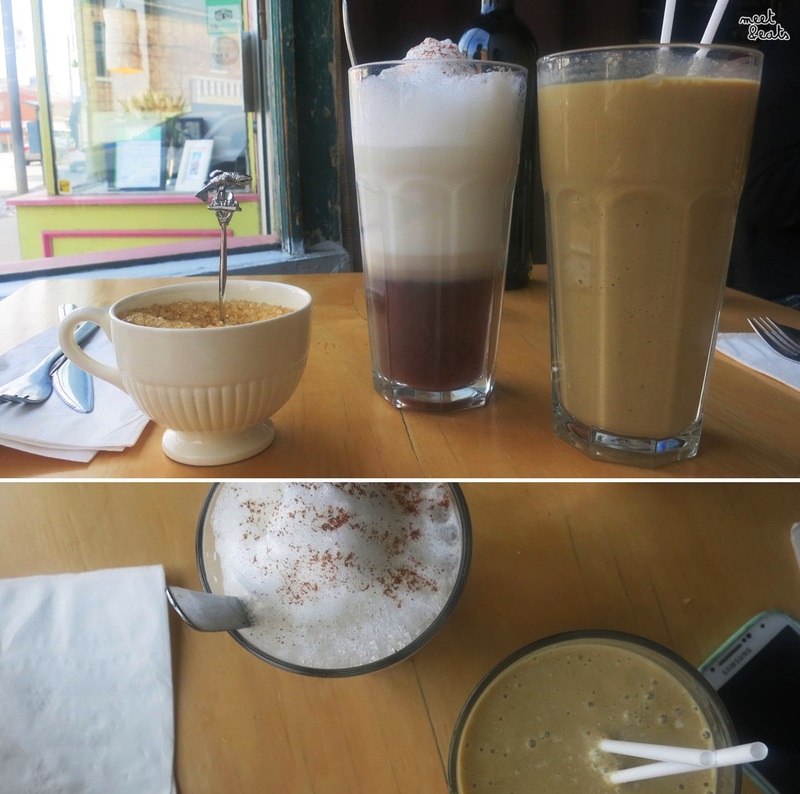 The second time I had this, it was not the same at all - it was exactly what you think and Avocado and Espresso Smoothie would be like, a slightly off unweetened Avocado Smoothie with no fun texture to go with. 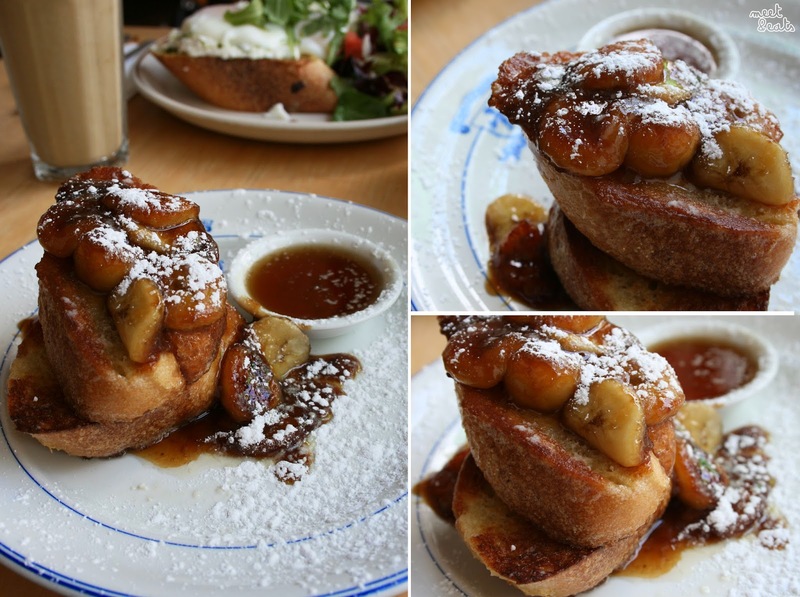 If you have a definite sweet tooth, a half order of Saving Grace's French Toast is most definitely for you! 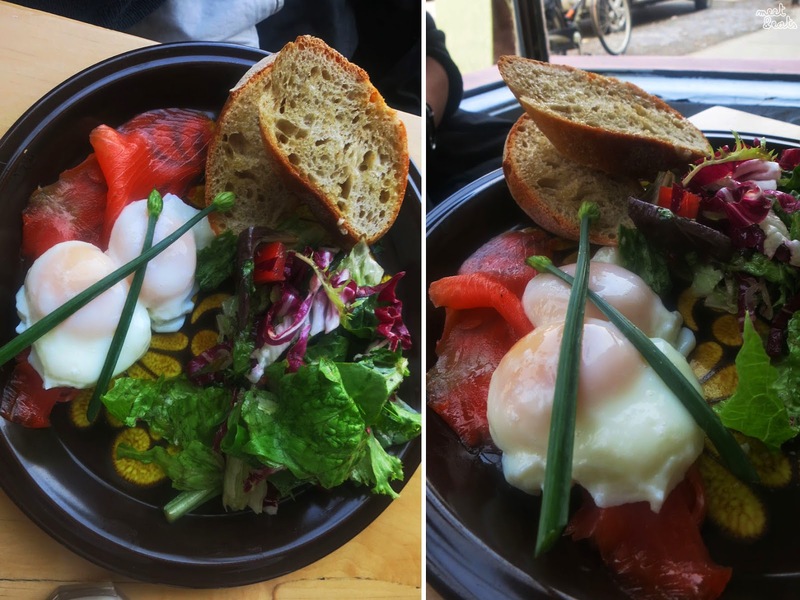 It was the perfect helping to share between two as well - it was well dosed in the Caramelized Banana Syrup, and the eggy Baguette Bread it was served with was sweet enough, that you did not need the dipping of Maple Syrup on side at all! They also serve up a 'full' order - which is $10. 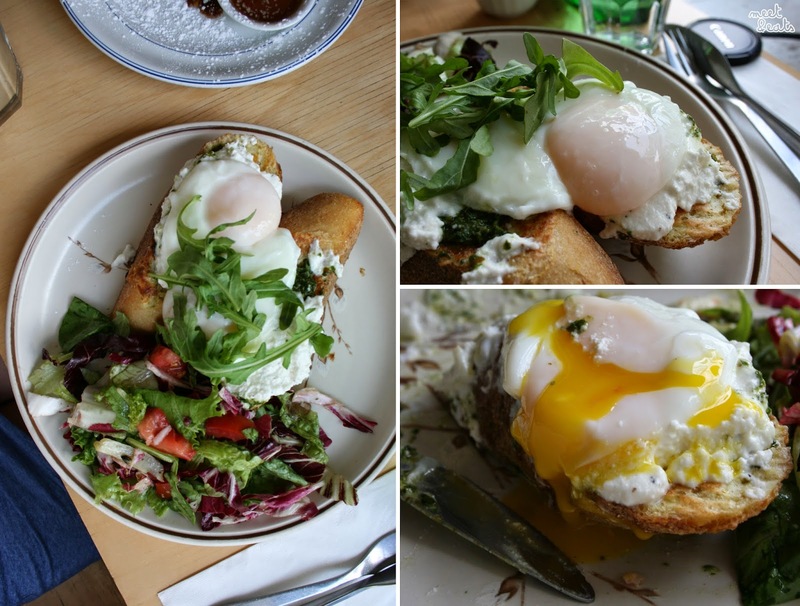 Choosing off the blackboard menu is a hard time, this was tasty, the Ricotta Herb Spread was innovative, and the Poached Eggs were a great runny match to the doughy, eggy Baguette Bread. 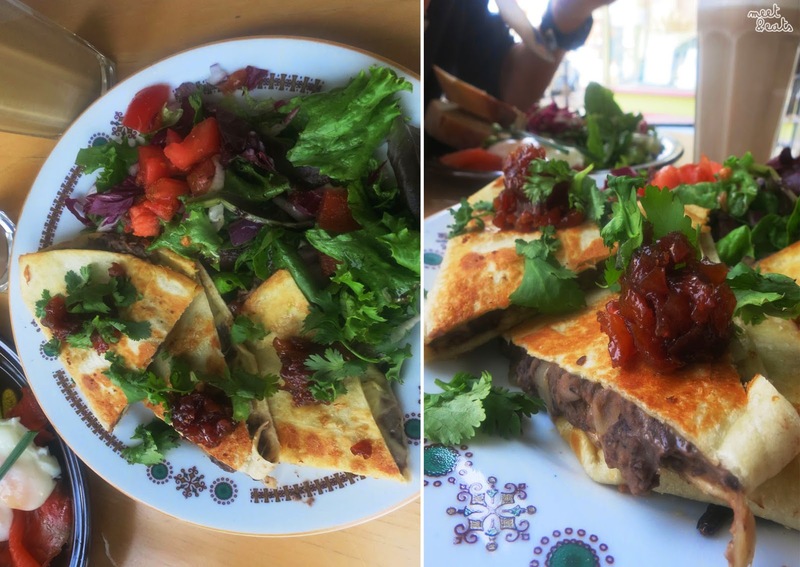 Nicely grilled Quesadillas, the Gouda Cheese to Blackbean ratio was perfect - the flavours were accentuated with the Apricot Chutney served to spread on top! With only one measly piece of Smoked Salmon, one can hardly add this to the title of the dish, disappointing! What? 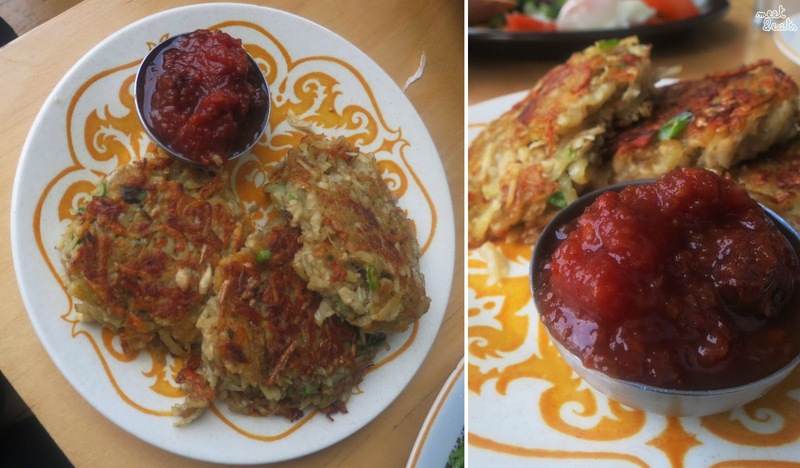 you ran out of Tomato Sauce for these? I will gladly accept your Tomato Chutney! The Potato Parsnip were very tasty, such a great mix of Potato and Parsnip, the Tomato Chutney weren't as flavoursome as I had hoped and wasn't needed. The Blackboard Menu has been on and off for me. 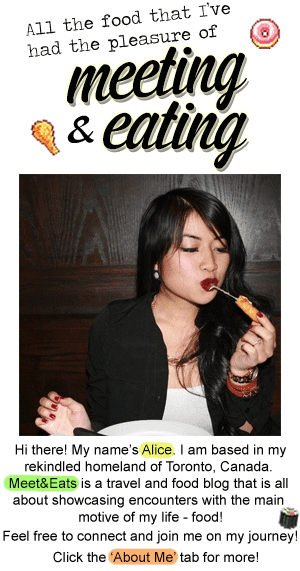 Unless something bizarre comes up, I'd rather stick to the regular menu - this menu includes your usual breakie desires - Toast, Waffles & Pancakes, Oatmeal, Sweet or Savoury French Toasts and Sandwiches! If I were to return, I would like to try their Waffles or Pancakes! Saving Grace will not be my first choice since I do not find the service to be of any value at all, I will gladly recommend elsewhere.